There are many types of hot air balloon baskets in our industry. They come in many shapes and sizes. We primarily use the square or rectangle hot air balloon baskets. The above photo is out Single T Basket used to carry up to six hot air balloon passengers. We use Cameron hot air balloon baskets. Cameron balloon baskets are the safest in the industry. Cameron has been building hot air balloons since April 1st 1971 by Mr. Don Cameron. Their headquarters, located Bristol England. Their quality and workmanship has been on display since their first day in business. With the average 500 balloons build per year. It is not any wonder why Cameron balloons is the leading hot air balloon manufacture in the world. Types of hot air balloon baskets. We primarily use 3 types of hot air balloon baskets for our Phoenix Arizona balloon rides. The first type is the Double T balloon basket. Seen above. The Double T Balloon Basket, built with a total of five compartments. The middle compartment is for the pilot, hot air balloon fuel (Propane) and all the hot air balloon pilots navigation equipment. The other four compartments are for our balloon ride passengers. In the photo they look small, but our balloon passenger compartments are rated for six. We never fill our balloon baskets to capacity. We only put four in each compartment. So worse case scenario you and your loved one will share the hot air balloon ride with one other couple. When we keep that two person vacancy in each compartment, it gives all the passengers plenty of elbow room and edge of the basket views. The Double T balloon basket used for large groups, events, team builders, and a larger audience for that days flight. The Single T Balloon Basket is the industry’s medium size basket. These are often used for small families and small group builders for companies wanting to treat their hard-working staff members. The Single T balloon basket is a small enough to know you, big enough to serve you style balloon basket. In the photo, the bottom compartment is for the pilot, fuel, and navigation equipment. The other two compartments are for the hot air balloon passengers. The compartments are rated for up to ten passengers, but we typically only put six passengers in. The Square Balloon Baskets are used for private flights. The pilot, fuel, and the passengers are located in the same basket together. They have various sizes, but in Phoenix Arizona the heat restricts us to two or three passengers for comfort. 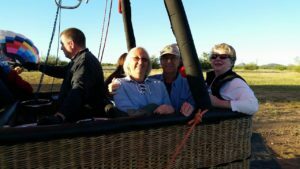 Many of the smaller hot air balloon companies in phoenix Arizona will often try to maximize the revenue of the flight by over packing these balloon baskets. Arizona Hot Air Balloons number one concern is safety. Second is comfort during the flight for our passengers. Third is Aesthetics of the flight for our balloon passengers. When you take your flight with us, you will come home with some amazing flights of the Sonoran Desert and not the backs of people’s heads. Want to know more about balloons? Subscribe to news letter and will give you valuable facts about hot air balloon. Hot air balloons are more than just hot air!